If there’s one thing I’ve grown to adore, it’s fun and happy feet! I never thought I’d be a sock person, but I totally am…..A fun pair of socks simply makes the day better. 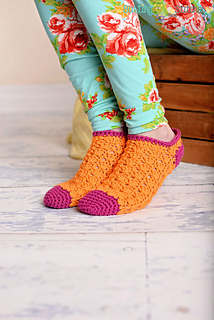 So, naturally, I’ve been really excited to share this super cute crochet sock pattern with you! Featuring two colors, the options are endless. Don’t they look really cozy too!? Thank you to Stacey of Busting Stitches for contributing this free sock crochet pattern as part of the Melody’s Makings Guest Contributor Program!